A customer in Penn Valley Pennsylvania purchased a new oven from a big box store and had them install it. The delivery men installed the oven, and then proceeded to turn it on while instructing the home owner to allow the oven to run for a half hour prior to turning it off. As she signed all of the papers and watched them leave her house, smoke began to fill her kitchen. She immediately turned off the oven and noticed that the men who installed it, never took out the plastic out from the inside. This caused the home not only to be filled with smoke, but also have a strong odor of burnt plastic. 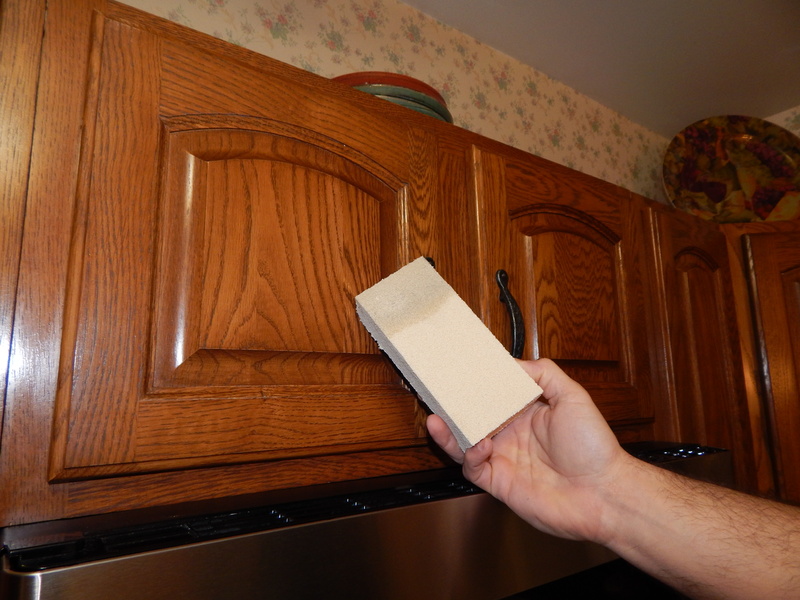 In the photo,the cabinet looks clean and without any damage, but as the dry sponge shows, the a thin residue was built up on the cabinets and surrounding walls. In researching the health benefits of apple cider vinegar I’ve found a lot of anecdotal evidence – stories from people of the beneficial effects of taking apple cider vinegar. There isn’t scientific evidence to back up all of these claims, but of course unless the studies have been done there won’t be. Lack of scientific evidence doesn’t imply that it doesn’t work. There was at least one study done on the effects of apple cider vinegar which used acetic acid – the acid component of vinegars. Now, I’d argue that apple cider vinegar is more than just acetic acid. In fact, apple cider vinegar consists of both malic acid and acetic acid. Being made from apples it would also contain pectin, as well as potassium, which promotes cell and tissue growth. Apple cider vinegar also contains almost all the minerals, vitamins and trace elements that our bodies need. Which leads me to suspect that some of the studies that are being done are fairly worthless exercises in determining the value of apple cider vinegar if they aren’t actually using apple cider vinegar in the study. Because science allows us to break things down into their component parts in order to understand how things work, I think too often scientists only see things as their component parts, missing the whole concept of the synergy found in nature. Everything has the potential to be more than the sum of its parts. The health benefits of apple cider vinegar will vary depending on the ingredients and process used in making it. Commercial production can use wood shavings, and other vinegars as the base (speeding fermentation), changing the makeup of the end product. You’ll get the greatest health benefits from apple cider vinegar that is made from organic apples, fermented using traditional methods, raw (unpasteurised) and unfiltered. If you can’t find good quality apple cider vinegar you could try making your own. This apple cider vinegar recipe has recipes for two methods of production. The one which uses whole apples will be of better quality for medicinal purposes, the one using scraps is quicker to make. You could make both so that you have something to use sooner while you wait for the whole apple batch to ferment. Be sure to avoid taking apple cider vinegar neat (undiluted) as it eats away at tooth enamel and can cause burns to the sensitive tissues in your mouth and throat. There have also been reports of apple cider vinegar supplements (in capsule form) causing permanent tissue damage of the esophagus. So use apple cider vinegar in liquid form, diluted with water. A simple tonic can be made from 1-2 teaspoons apple cider vinegar, 1 teaspoon honey in a cup of warm water.